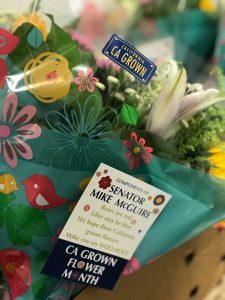 On Monday, the California Senate officially declared June to be “California Grown Flowers Month.” The resolution was put forth by Sen. Mike McGuire who represents the state’s 2nd Senate District. Members of the state Senate acknowledge California’s flower farmers for the value they bring to their communities and the state’s economy. Pictured left to right: Sen. Bill Monning, Sen. Henry Stern, California flower farmer Anthony Vollering (back), Sen.Hannah-Beth Jackson, Sen. John Moorlach, California Cut Flower Commission CEO and Ambassador Kasey Cronquist, Senate President Pro Tempore Toni Atkins, Sen. Kevin de Leon and Sen. Mike McGuire. Members of the Senate arrived on the Senate floor to find a beautiful bouquet of CA Grown Flowers on their desk. 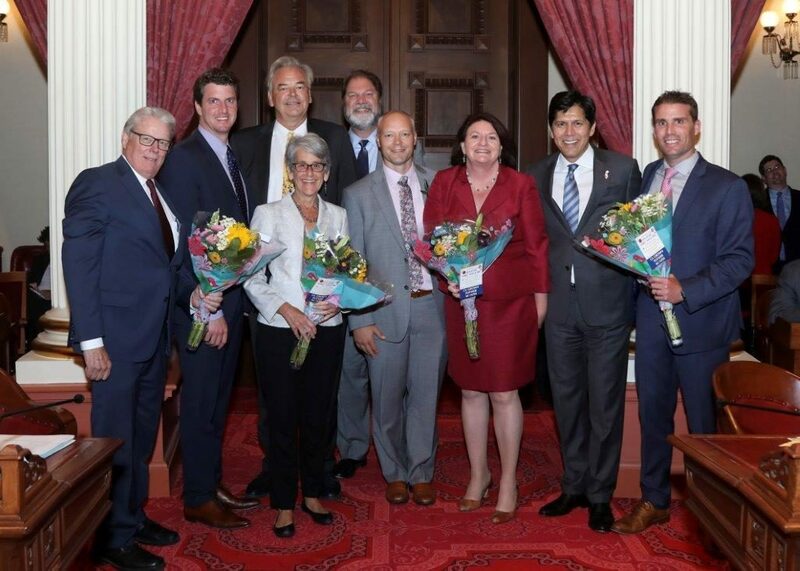 In honor of the declaration and accompanying resolution, senators, flower farmers and California Cut Flower Commission CEO and Ambassador Kasey Cronquist gathered on the Senate floor – California Grown Flowers in hand. The resolution notes that the designation is designed “to recognize and honor the men and women of the California grown flower industry for their dedication and productivity,” and describes that statewide, flowers are grown across 701 million square feet, spanning the distance from San Diego through the Inland Empire to Carpinteria and north all the way to Oregon. The resolution also recognizes the flower industry’s impact on the state’s economy, creating 145,665 jobs, generating $12.2 billion in business activity and creating $1.1 billion in additional taxes. It was a proud day, and we’re thrilled to celebrate California Grown Flowers Month throughout June. Join us!